To join e-mailing list, send email to address above with SUBSCRIBE in the subject line. 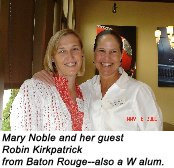 W Alums in the Birmingham Area: Betty Debay Hull '64 has arranged for us to have lunch in the main dining room (upper level) of The Club. We will be able to order individual preferences but will need to give our checks to Betty to pay for lunch. We appreciate her willingness to arrange this lovely setting for us to get together. We are hopeful we will have surprise guests from Columbus, MS but details are not yet final. Please make your plans to be with us on Saturday, August 22 and invite other W friends. If you will let us know that you will be able to come, we can reserve your place! RSVP to Shirley Rutherford Spain '64 by phone or email. 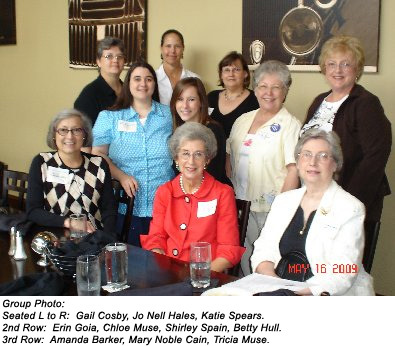 Saturday, May 16, 2009, a group of alums living in and around Birmingham became an informal chapter over a delightful lunch at the Grey House Grill in Homewood. There were nine members present and two guests. We hope to meet again in August!